Winter is coming and the time for hearty and warming stews topped with delicious golden crisp pastry is near. Pies! My mouth is watering at just the thought. I already wrote about pies when I did a series of posts on classic home cooking, namely my delicious steak pie and shepherd’s pie but I really felt that chicken pie needed to be added to the collection since this meat is so popular. I was thrifty with this dish, wasting nothing, as one always should when eating meat. I took one small bird and got maximum use from it, roasting the meat on the bone then using the carcass to make some stock. I then reduced this down to intensify the flavour and enriched it with sherry and a little beurre manié to make the gravy for the pie. This dish will take most of the day to cook, but I make no apologies for this. I hate to compromise flavour for the sake of saving time. In any case, there are few things that I enjoy more than spending all afternoon in the kitchen creating something delicious. I served it with some leeks sautéed in butter, and it was fantastic. Heat the oven to 180C. Soften the butter and using your fingers rub all over the chicken and in between the skin and breast meat. Roughly chop the basil and half of the parsley and also stuff this under the skin of the breast. Season liberally with sea salt and place the chicken in a roasting dish into the oven for about 1 hour and 30 minutes or until the meat is just cooked, tender and juicy basting with the juices and butter every 20 minutes. When the chicken has cooled slightly, take all of the meat off the carcass and roughly chop. Set aside. To make the stock: Now break the carcass up into small pieces using a meat hammer or cleaver. Set a deep, thick bottomed pan over a high heat and pour in a couple of glugs of vegetable oil or rapeseed oil. Fry the chicken bones, turning occasionally, until they are uniformly golden brown. Add 1 carrot, the onion, celery and garlic and fry for a couple of minutes. Pour in enough cold water to just cover the bones and bring to the boil, skimming any froth or fat that rises to the surface. Simmer gently for 4 hours. Strain the stock into a separate pan, add a glassful of dry cooking sherry and boil until reduced by 1/3. Take the 2 remaining carrots and cut into chunky dice. Cook these until tender in the stock while it is reducing, removing them with a slotted spoon once done. Whisk in a few pieces of beurre manié into the reduced stock until a nice gravy consistency is achieved. Stir in the remaining parsley and the thyme, roughly chopped, and add the carrots, chicken meat and smoked ham. Season carefully with salt and pepper, then leave to cool completely. Now to build the pie: roll out the puff pastry to about 5mm thick. 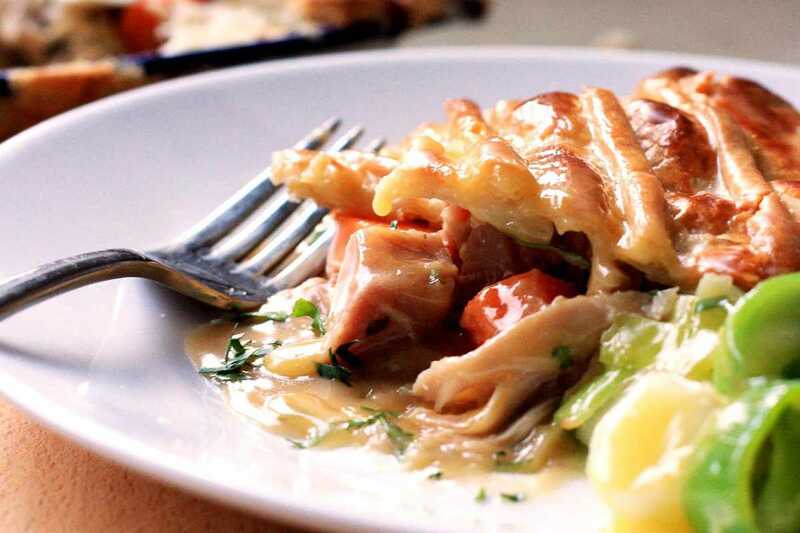 Pour the chicken mixture into a pie dish and drape the pastry over, pushing the edges down with a fork. Use the trimmings to decorate the top. Make two slits for steam to escape, then brush liberally with egg wash. Place in the oven at 180C until the pastry is nice and golden.